In 1964, during his legal battles, Ginzburg launched a quarterly social commentary journal called fact:, and it was a masterpiece of design and content. Bringing to mind the best of Esquire, Rolling Stone, Spy, and The Realist, fact: was "dedicated to the proposition that a great magazine, in its quest for truth, will dare to defy not only Convention, not only Big Business, not only the Church and the State, but also — if necessary — its readers." (From the introduction to 1967's The Best of Fact, by Warren Boroson). 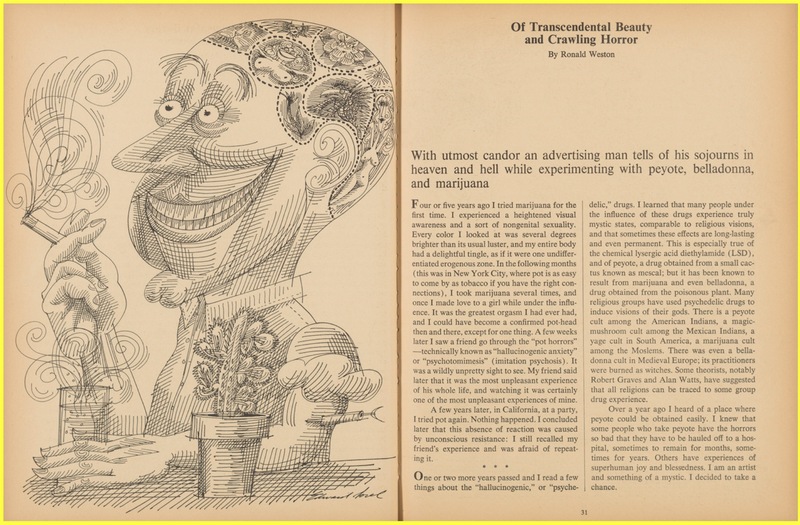 The first issue had a delicious takedown of Time magazine, the titan of news magazines in 1964, with quotes from dozens of intellectual luminaries attesting to Time's treacherousness, propensity to lie, and prejudices (P.G. Wodehouse: "Time is about the most inaccurate magazine in existence."). The first issue also ran an Madison avenue advertising executive's "sojourns in heaven and hell while experimenting with peyote, belladonna, and marijuana," a profile of American Nazi Party founder George Lincoln Rockwell (titled "The Man Who Thinks Goldwater is a Communist"), a piece examining "The Sexual Symbolism of Christmas," and an essay by Bertrand Russell on the inadequacy of the nuclear test ban treaty. In later issues, author Robert Anton Wilson became one of fact:'s editors. After fact: folded in 1967, Ginzburg launched Avant Garde, a magazine "exuberantly dedicated to the future." You can see all 4 issues of Eros here. And the Avant Garde archive (14 issues) is here. All three titles were art directed by Herb Lubalin (1918-1981).